(December 20, 2014 The Star, Kenya) FIRST ever Africa under-18 (boys) baseball World Cup qualifiers ends today at the Meru University of Science and Technology, with Kenya out of the running for the gold medal contest. The Kenyan teens lost all their preliminary matches and were pushed to contest for the third and fourth position. The home team was clubbed by six runs by Tanzanians in a match that ended 20 runs to 14. In the second match, a more experienced South African be Kenya by 30 runs to zero while Uganda punished the hosts 36-1 to book a date with Tanzania in the playoffs. In the first playoff, South Africa proved to Kenyans that they still have a long way to go by handing them 24 runs to zero. South Africa, ranked 31 worldwide, won all their matches 8-5 and 34-1 against Uganda and Tanzania respectively, while Uganda defeated both Kenya and Tanzania. South Africa face the winner in the match between Uganda and Tanzania, whereas the loser lock horns with Kenya to determine the bronze medallist. The winner in the gold and silver match gets the sole ticket to represent Africa in the 12-nation tourney at the 2015 under 18 (boys) World Cup at the historic Koshien Stadium in Nishinomiya, Japan. This is the first international tournament in the continent and has attracted four nations thus— South Africa, Tanzania, Uganda and hosts Kenya. Nigeria didn’t turn up for the show for unspecified reasons. Apart from South Africa, who took part in the Canada 2010 World Cup, the rest have no experience in international competitions. 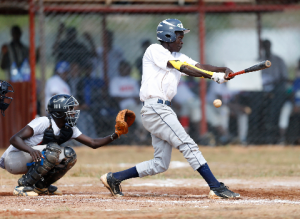 Kenya Baseball Federation (KBF) secretary general, George Mahinga, said this is a big step in the development of the game in Kenya and Africa as a whole. “The discipline has not been actively involved in competitions both in Kenya and continentally, but we have now started the journey to establish, then later raising the bar of completion in Africa,” said Muhinga.